Scapa is proud to introduce an additional group of polyethylene (PE) film tapes with the creation of Polyflex Plus. 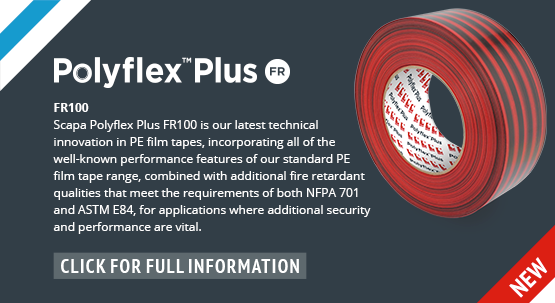 Our range of PE tapes offer superior performance characteristics when it matters. For further information and to order your sample, please contact us. Whether your application is in splicing, industrial masking, surface protection, repair or cocooning, Polyflex products have been used consistently and successfully in the North American market, fulfilling demanding environmental and technical performance requirements. Our Scapa Polyflex range is recognised as a global market leader in this field, with unrivaled technical capabilities and in house extrusion of PE for ultimate control and consistent quality. With many decades of experience in the manufacture of quality PE film tapes, Scapa's broad range of PE tapes offers an unrivaled selection of adhesive solutions for distributors and end users that are looking for the high performance satisfaction that PE tapes offer. 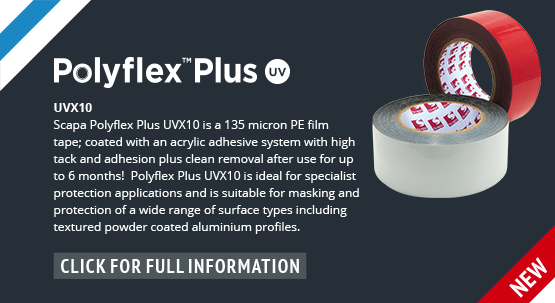 Our Polyflex range includes options on thickness, UV resistance, adhesion levels and strength, allowing you the choice of either straight or serrated edge for easier tear, so that you can match your own performance criteria to the correct product for the application. Looking for a sample or further information on any of our PE range?